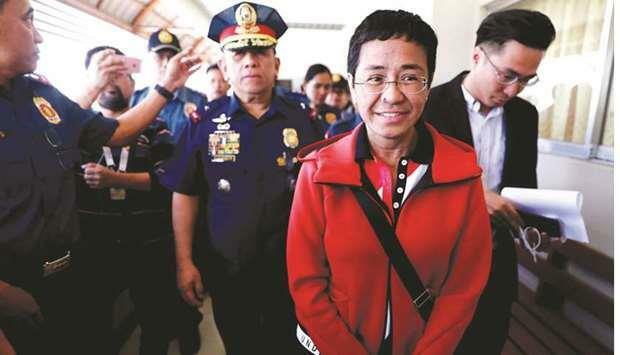 (MENAFN - Gulf Times) A Manila court has rejected an appeal of Rappler chief and Executive Editor Maria Ressa and former researcher Reynaldo Santos Jr to junk a cyber-libel case against them for lack of merit. Judge Rainelda Estacio Montesa of the Manila Regional Trial Court (RTC) Branch 46 on April 12 ruled that there were enough elements of libel claimed by the Department of Justice (DoJ) on its charge sheet, as provided under Section 4(C)(4) of Republic Act (RA) 10175, that the prescription period for cyberlibel is 12 years, not one year, as provided under RA 3326. Section 2 of RA 3326 states that: 'Prescription shall begin to run from the day of the commission of the violation of the law, and if the same be not known at the time, from the discovery thereof and the institution of judicial proceeding for its investigation and punishment. Ressa and her co-accused, through Free Legal Assistance Group's Theodore Te, their legal counsel, used as reference to challenge the DoJ's position a Supreme Court decision in 2014, which said cyberlibel was 'not a new crime, but is one already punishable under Article 353 (of the Revised Penal Code or RPC). Article 353 of the RPC provides that libel or other similar offences shall be prescribed in one year, which means one cannot be sued for the offence one year after a purportedly libellous story is published. Montesa dismissed this argument. 'The instant case was filed in court on February 5, 2019, which is well within the period of 12 years, negating the assertion raised by the accused that the offence already prescribed, she said. The charge stemmed from a resurrected complaint of businessman Wilfredo Keng in connection with a supposedly libellous article by Rappler on May 29, 2012, titled 'CJ using SUVs of ‘controversial' businessman, posted four months before the law was enacted. Keng filed the complaint in 2017, which was dismissed, but revived less than a week later by the National Bureau of Investigation. Montesa also rejected the argument in the motion to quash, which said the law was under temporary restraining order (TRO) from Oct 9, 2012 continuously until April 22, 2014, thus 'there was effectively no Cybercrime Prevention Act of 2012, meaning no statute could be applied retroactively. The DoJ used 'republished to apply the Cybercrime Prevention Act on the article, but Te said minor corrections did not equate to 'republication, because 'to treat the changes as republication would be inappropriate and defeat the purpose of the single publication rule, citing court decisions from the United States. The alleged republication was done on Feb 19, 2014, when the TRO was still in effect, the appeal said. The judge said the TRO 'merely suspends the implementation and enforcement of RA 10175 so that crimes committed during the said period cannot be prosecuted. However, it did not suspend its effectivity. 'So, while crimes committed during the said period cannot be prosecuted during the effectivity of the TRO, they may be prosecuted after the lifting of the same just like what is done in this case, she added. Montesa said Rappler's corporate liability could be proven in court. Because of the dismissed plea, Rappler, Ressa and Santos' arraignment is set to push through today at 8.30am at RTC Branch 46.